We’re talking about Cancun, Mexico! 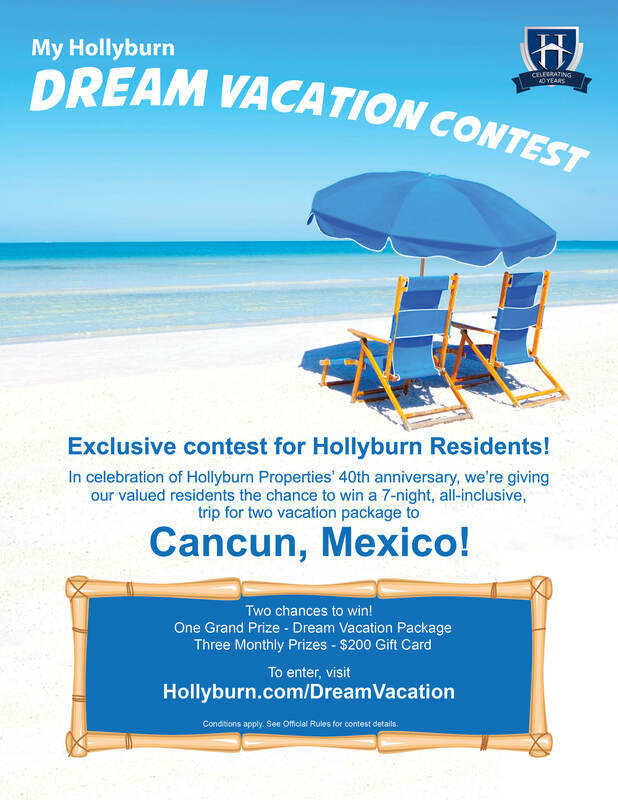 Enter the ‘My Hollyburn Dream Vacation Contest‘ and this magical experience could be yours! In celebration of Hollyburn Properties’ 40 Year Anniversary, we have launched a resident-exclusive contest to thank our loyal community. The grand prize features a 7-night, all inclusive dream vacation for 2 people to Cancun, Mexico, at the El Dorado Royale gourmet resort by Karisma, valued at $5000! But that’s not all. In addition to the grand prize, residents have a chance to win one of three monthly prize draws of a $200 gift card to their choice of selected retailers. Please submit a short video testimonial (cell-phone cameras do wonders!) letting us know what you love most about living with Hollyburn. To enter, and for all contest details, visit our website. #Hollyburn40. Extra entries available to increase your odds!